For long, the music industry has been trying to figure out how best to use the internet in sales. 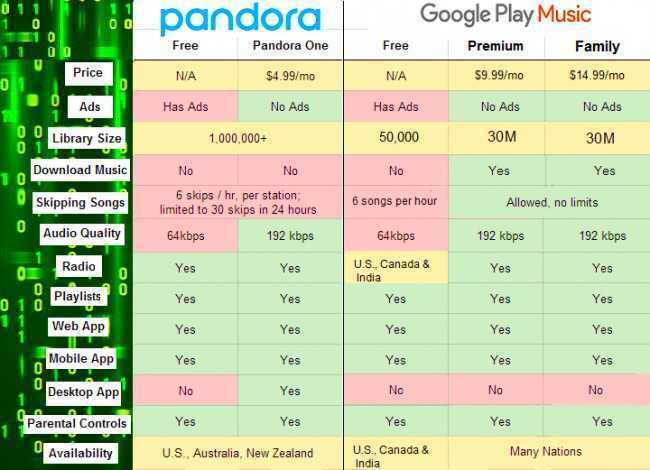 With the rise of free streaming sources like Pandora and Google Play has led to the industry being utterly disappointed. The music streaming service industry has these two going neck to neck for dominance. In case you are looking for the most personalized radio experience, Pandora is the best at predicting something you would enjoy by using over 400 selections attributes, which makes it easy to match your taste and preference of music. It’s quite a unique feature to have on Google Play Music which only offers recommendations when the user commands it to. Even though the two offer free streaming services, they differ in several ways. Google Play currently prides itself with 35 million songs since it was launched and users can upload up to 50, 000 songs of which can then be added to their library for streaming. Compatibility wise, Google play music is available on most mobile and computer devices or basically anything with a web browser. 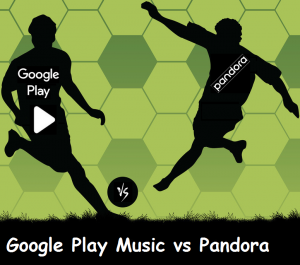 Pandora internet radio has over 800,000 songs from 82,000 artists and singers all over the world, but only available in United States, Australia, and New Zealand giving Google Play an upper hand. It’s compatible with thousands of devices and easily accessible from a PC or a laptop. Available on several different mobile platforms like Android, Blackberry, Window s Mobile, and iOS, but you cannot download the app unless you live in the three countries mentioned above. While both of them offer free subscriptions, some features are accessible at fees that vary. For Pandora, there is a free tier that supports ad, a Pandora plus, and a premium subscription. With the free ad-supported Pandora, you can create stations according to your favorite artists, genres, and songs. However, Google play has zero advertisements in the interface and while playing music. Pandora Plus ($4.99 a month) gives you the ability to replay tracks, listen to your most played offline stations, has a high-quality audio, and a longer timeout period. Pandora Premium ($9.99per month) is an upgrade of plus where you get the ability to search, play songs on demand, more offline listening options, fully customizable playlists, and has no timeouts. Google Play has a family plan of up to 6 members for $14.99, unlike Pandora that doesn’t offer a family plan option. Though it’s free, there is a limit as to how many songs you can listen and store for free with your device. Unless you enjoy using the application, listening to all the music in the world would be boring if the design is dull and unattractive. Google Play Music has a bright, colorful and enjoyable music browsing experience. On opening the menu, several options like top charts, listen now, new releases, music library, browse stations, and settings appear on screen at a go. However, Pandora comes with extra options that allow users to rate each song; it’s design is spontaneous which makes it easy for users to pick up quickly as it’s simple as well. Chrome cast boosts Google Play as a music streaming service, because it can link you to YouTube and other music streaming service expanding its catalog. Though Pandora’s design is not as bright as that of Google play app, it’s beautiful especially with the recent launch of Pandora Premium. Google Play Music app allows you to create your playlist where you find the songs you want, add to playlist. And you can playback in random order or sequentially.With free access to YouTube, your playlist functions perfectly with YouTube audio being accessible offline. In addition, you can make your playlist public and share it as well with other users. Pandora auto generates playlists after you have rated (thumbs up) five or more songs on stations you have created. Every time you thump a song, it’s automatically added to this playlist which plays the only songs you have rated with a thump up. Though you can share your playlist to any medium you prefer, Non-Pandora Premium users can view your playlists, but the ability to play is only possible if they upgrade. Unlike Google play, Pandora limits your playlist to only a particular song or artist, and the player doesn’t allow rewind or repeat any songs. There are more differences,particularly when additional features are concerned. Their sound qualities differ where the highest quality of Google play is 320 kbps and 192 kbps for Pandora. Both offer specified duration for a free trial after which users choose their preferred music streaming services. Users have a tough time deciding on the best, and even if these apps are engaged in an epic battle to dominate, only uniqueness will make one stand out among others.